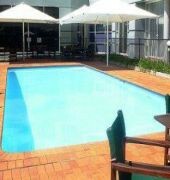 Situated in Bass Hill, Rydges Bankstown is close to Crest Sporting Complex and Bankstown Golf Club. Additional area attractions include ANZ Stadium and Sydney International Aquatic Centre. The hotel offers fresh and contemporary accommodation and is decorated in a modern style, with a tasteful mix of bright and neutral colours. Rydges Bankstown has an outdoor pool and a spa tub. Guest parking is complimentary. In addition to the 120 guest rooms, the air-conditioned establishment features a lobby with 24-hour reception, currency exchange facilities and lift access. 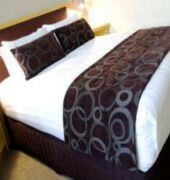 Each of the rooms at Rydges Hotel is decorated in a modern style, with a tasteful mix of bright and neutral colours. They feature the renowned Rydges Dream Bed and a state-of-the-art entertainment centre, which has USB ports for iPods and laptops. High-speed broadband and wireless internet access is also available. 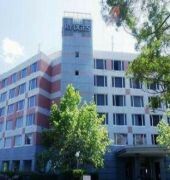 The Rydges Bankstown is a Tourist hotel. Located in City Centre area. Shopping is accessible by bus/taxi and the nightlife/restaurants are located in the hotel. 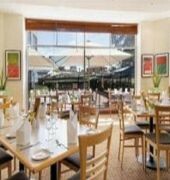 Descriptionclass="small" style="text-align: justify; font-size:11px;">Situated in Bass Hill, Rydges Bankstown is close to Crest Sporting Complex and Bankstown Golf Club. Additional area attractions include ANZ Stadium and Sydney International Aquatic Centre. The hotel offers fresh and contemporary accommodation and is decorated in a modern style, with a tasteful mix of bright and neutral colours. Rydges Bankstown has an outdoor pool and a spa tub. Guest parking is complimentary. In addition to the 120 guest rooms, the air-conditioned establishment features a lobby with 24-hour reception, currency exchange facilities and lift access. Each of the rooms at Rydges Hotel is decorated in a modern style, with a tasteful mix of bright and neutral colours. They feature the renowned Rydges Dream Bed and a state-of-the-art entertainment centre, which has USB ports for iPods and laptops. High-speed broadband and wireless internet access is also available. Only 3 towels and 1 face washer for 4 people. Housekeeping said they were out of face washers and we were given hand towels. Thank you for taking the time to share your experiences on your recent stay at our hotel. It is disappointing to read of the issues you faced during you stay. We pride ourselves on our cleanliness, and to hear that this was not the case during your stay is very concerning. Please rest assured that this has been addressed with our housekeeping team. In regards to your room, please know that at our friendly 24 hour reception team are available to assist in the event of our guests are having issues with things like bedding configuration. We always endeavor to ensure our guests have a comfortable stay and although we have let you down, I do wish for you to return so that we can ensure that you have a true Rydges experience. Thank you for your amazing review of our hotel. It is wonderful to hear that you enjoyed your stay and we look forward to seeing you on your next trip to Sydney. Thank you for your amazing review of our hotel. It is such a great pleasure to hear that you had a comfortable stay and an excellent sleep. I do have to apologise for the shower pressure in your room. Please know that this has been resolved by our maintenance team. We look forward to welcoming you back on your next visit. Great accommodation at a great price. The room was fine for 2 adults and our 2 teenage children. Good location and great amenities. Very clean .We were attending a Martial arts championship at the Whitlam Leasure Centre at Liverpool, so this was a good central location for accommodation. 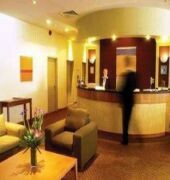 We are also members of Rydges Club. Thank You. Thank you for your amazing review of our hotel. It is wonderful to hear that you and your family enjoyed your stay and we look forward to seeing you on your next trip to Sydney. Most of the staff were friendly, some of them found it hard to find a smile, let alone talk to you. Dinner and breakfast were great too. Window locks in our room were broken so the window could be opened wide. An accident waiting to happen. They need to get onto this safety issue straight away. Thank you for taking the time to share your experiences on your recent stay at our hotel. It is always a great pleasure to hear that you had a great interaction with our restaurant team and enjoyed dining for both breakfast and dinner. I would like to apologise for the window locks in your room. This is most concerning and will be addressed with our maintenance team for urgent repairs. Thank you for bringing this to our attention. We don't want this to be your final experience at our hotel and do wish for you to return so that we can ensure that you have a true Rydges experience.